John Kiley's Fractographs (2016) are shattered optical crystal blocks, 21 by 13 1/2 by 3 inches. 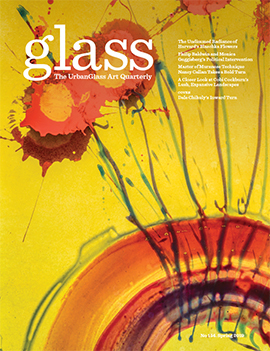 GLASS Quarterly Hot Sheet: This work represents a sharp deviation from what you'd been doing up to now. What inspired this major shift? John Kiley: The new work developed simultaneously along with the work I’m known for. You might recall from the last SOFA that my work was becoming more and more deconstructed, and it became even more so over the course of the winter. I had these optic blocks made because I was thinking of doing something architecturally based with eight blocks, but when they arrived, I felt I needed to break them. It was a primal thing — an urge to smash these things and put them back together. That’s really how it started. GLASS: Had you seen someone else do this before? Kiley: I hadn’t seen it done with optical crystal, but it seemed like an obvious idea . My idea was not to make something beautiful, even though that may have been the end result. For me, the work is about energy and capturing this moment of impact, and everything that is going on physically, mentally, and emotionally, is captured in this block in this indelible record. It goes back to the same thing in my spherical forms, back to breaking the perfect object as a child (See GLASS #129, Winter 2012), and then living with it. ...I can’t find anybody whose done anything exactly like this – you can find references to conceptual artists who broke plate glass on the gallery floor, or Yoko Ono shot a bullet through glass. 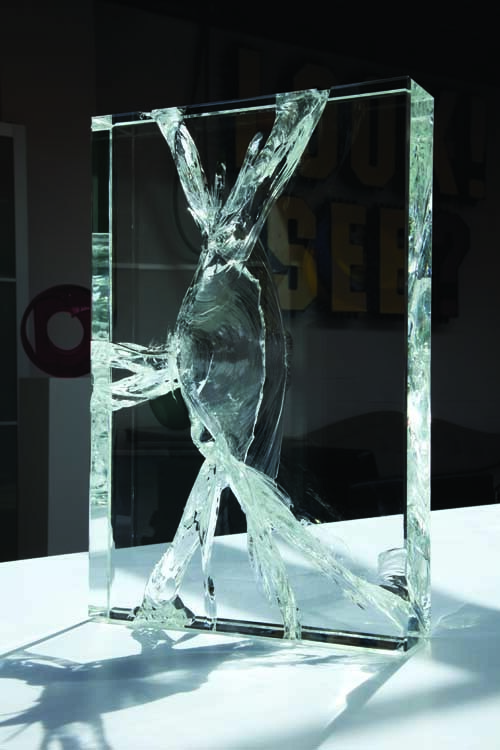 GLASS: There is clearly a strong conceptual aspect to this newest work. How is that conveyed in the exhibition? Kiley: The gallery display has eight pieces, and also shows the sledgehammers I used to break them. There's pine tar on the sledgehammer handles, which makes it grippy, but it also captured my hand prints and fingerprints. Also, each sledgehammer has marks left on the metal sledgehammer, itself; there’s an effect that happens in reverse, there’s a mark left on the metal, and you can feel the energy coming back up when you hit. GLASS: Did you set parameters for the process? Kiley: The rule was one hit, I only hit them once. My own rule was to try not to miss. I didn’t experiment too much in hitting in a specific location, and it’s random. But the thing to keep in mind is that glass, as it cools, the molecular patterns are random. When you’re breaking glass, or other materials, the bonds break apart on an atomic level. It’s impossible to reproduce the same break twice. Even in a laboratory environment, using the same implement, the same size piece of glass, you would never replicate the same fracture pattern. Each one is as individual and unique as a fingerprint. 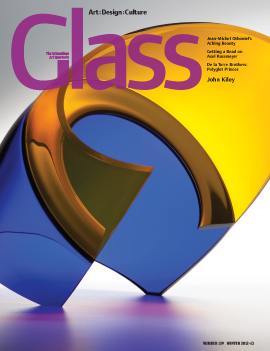 GLASS: What's remarkable is how different this process is from the precision cutting you had been doing. Kiley: I recently relocated to San Francisco, where I spend half my time, and when people introduce me, and I'm introduced as a glass artist, the conversation isn’t about what you do, and why you do, but how do you do it? Even though the other work I make is based on a specific set of rules and concepts, I don’t get to have a conversation about that. This new work was about wanting to do something that had nothing to do with technical mastery of the material. Although It’s very challenging to put the pieces back together, the work is not about that, though you need technical knowledge to do that. It was a reaction to the pressure to keep the machine going. If you’re successful as an artist, and known for a certain type of work, there's both pressure to make different things and change, but also pressure to stay the same. This was a chance to stay in the studio and do something entirely new. 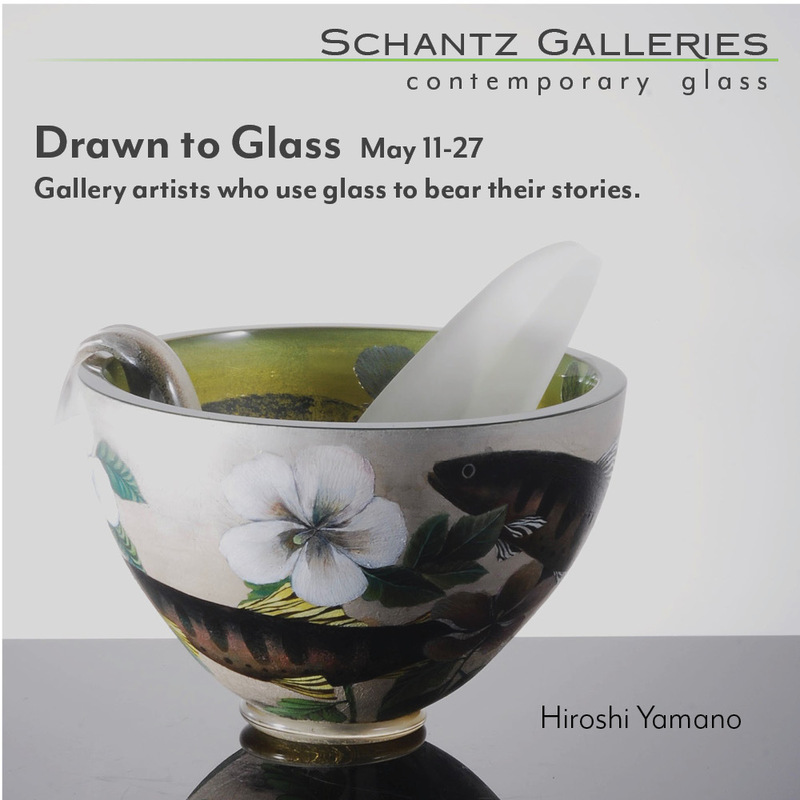 GLASS: Will you be showing both this newest work and some of the work that preceded it in the exhibit that opens this evening? Kiley: It was only about two months ago that I decided to show this body of work. I had made a series of 12 or 13 different pieces that I was intending to show. Then, only two months ago, I had a meeting with Sarah Traver. She had seen a few of the new fractographs and I told her I couldn't see how to reconcile showing the two bodies of work simultaneously. We decided to show the eight blocks and nothing else. The gallery is behind it 100 percent. GLASS: The work does have the feeling of such a break with what came before. Was it like breaking "the golden chains" of your earlier success? Kiley: It was taking the chance to put "the golden jacks" down and make things that are meaningful in other ways. Being a classically trained glassblower with 25 years under my belt, nobody was going to be giving me permission to do work like this. It had to be done, at some point, you just have to put yourself out there. 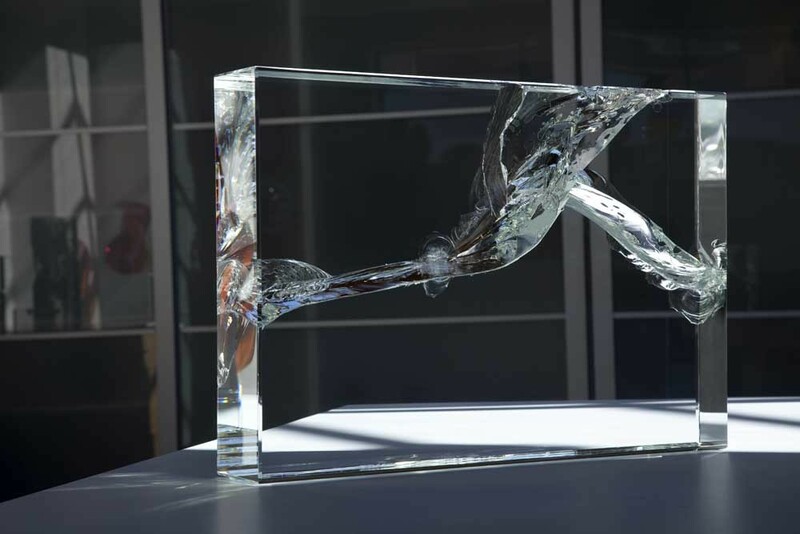 GLASS: Will there be other elements in the gallery to support the work's conceptual nature? Kiley: There'll be a video screen in the gallery, and the soundtrack is the sound of the breaking glass slowed down. The sledgehammers are here of course. 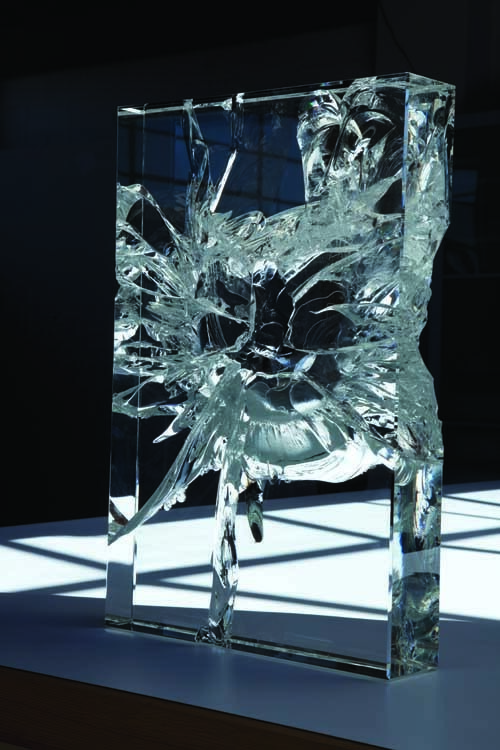 Also the catalog has a paper a professor at Cal Tech wrote about what happens when glass breaks. There’s a whole study of the fracture of brittle materials, a whole science. "Fractographs" is a made-up term based on the study of fractures. A lot of interesting things on a scientific level – you’ll never see a radial fracture intersect and continue on another crack, it will always hit and change directions, and there’s all kinds of amazing technical terms, such as "hackle" and "mist" and "concoidal fractures," it's very rich territory. In this exclusive video, see 3-D views of the new work.